This frontispiece, from Richard Bentley’s 1728 edition of Roman lyric poet Horace’s works, is full of symbolism and imagery. A bust of Horace (65-8 BC) sits on a plinth centre stage; and on the right stands Apollo, the god of lyric poetry (among other things), recognisable from his long hair, lyre, laurel wreath, and bow and arrows. On the left, Euterpe, one of the nine Muses, crouches, grasping her signature flute. On the far right, the god Pan, associated with rustic music, in his guise as a satyr with his goat hooves and horns, is embraced by a cherub who removes his theatre mask. Dutch artist Jan Goeree (1670-1731) was responsible for drawing the image after which the engraving was made for printing. Edited by Richard Bentley, “Q. 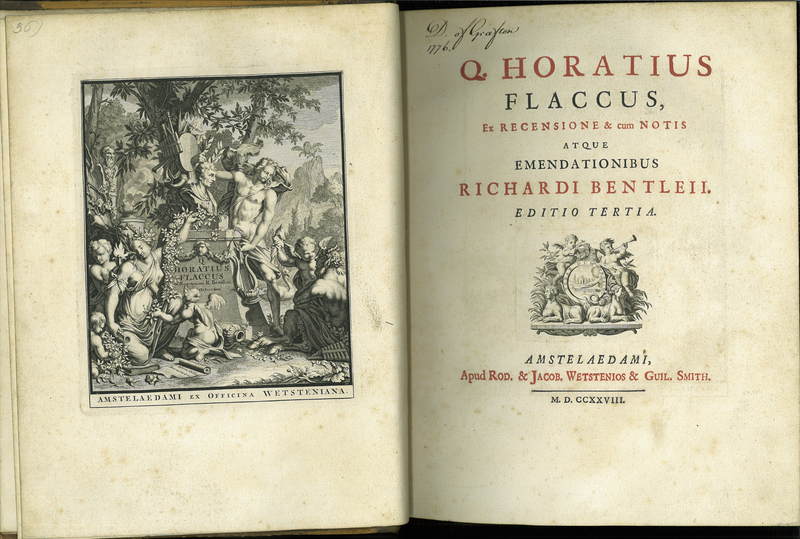 Horatius Flaccus. Third edition,” ourheritage.ac.nz | OUR Heritage, accessed April 26, 2019, http://ourheritage.ac.nz/items/show/10680.